Viper Performance can now supply their range of fuel cells in 5-, 10- and 15-gallon capacities and the aluminium tanks are filled with yellow anti-explosion foam in case of accident. The fuel pick-ups are positioned in the cavity at the base of the tank in a small sump area, which prevents fuel starvation under high G-force cornering or braking situations. 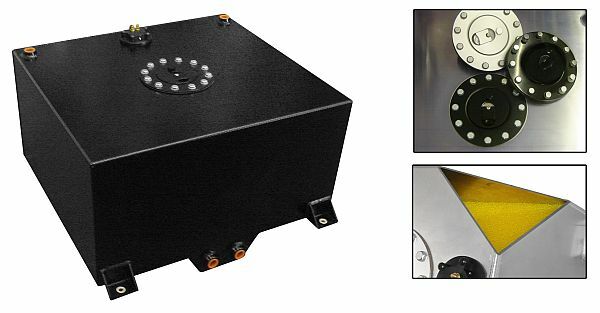 The tanks are available in natural metal or anodised black and come with a fuel sender unit, anodised aircraft style pull and twist fuel filler cap, and mounting brackets, with all parts available as spares. Fuel returns and connections are all AN-8 female threads and are compatible with Viper’s stainless steel braided hose connections. Prices range from £289 inc VAT for the 5-gallon version up to £399 inc VAT for the 15-gallon cell. More details at the other end of 0845 095 3423 or from www.viper-performance.co.uk ENDS. Print article This entry was posted by admin on February 21, 2013 at 5:31 pm, and is filed under News. Follow any responses to this post through RSS 2.0. Both comments and pings are currently closed.